But first of all, let us dwell on a few technical details and find out how to implement this solution. In order to have your Outlook direct attached files to a dedicated storage, you will need a special tool, which can be found in the wide range of MAPILab Outlook add-ins. 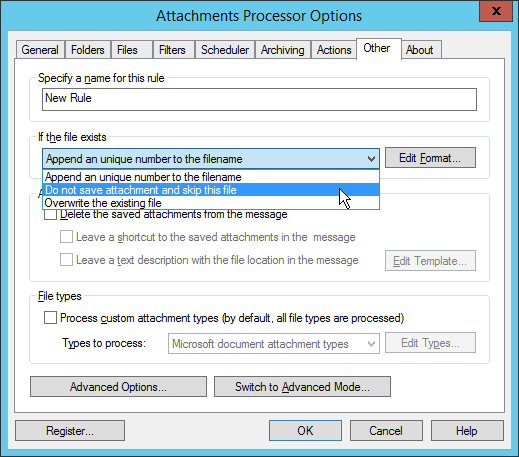 It is called Attachments Processor for Outlook, and the name speaks for itself, basically. After its installation in Outlook 2013, you will find its toolbar under MAPILab tab on the Ribbon, and this is what its Options window looks like. The add-in is a simple, ready-to-use extension of your email client functionality, and further on you will find some tips on how to make it truly efficient and powerful. The first reason for evicting your attachments to a file server is that your email database will drastically shrink in size. Although you may not attach files to every message, even a medium-sized Office document is larger than just a message without an attachment. Naturally enough, modern hard disks do have enough space for almost any email database. But what about the size of mailboxes on the corporate Exchange server and the need to archive items every now and then? Given that more and more companies opt for external email providers, cutting down the cost of their services by storing attachments on premises seems a pretty viable idea in the long run. However, when the add-in moves your attachment to the dedicated folder, the message size remains the same. In order to decrease it, do not forget to compact storages in the relevant section of Tools. The second reason is to speed up your Outlook search, as the lookup speed is inseparably linked to the size of your database. What is more, if you need to find an item in attachments, you will be able to benefit from indexing capacity of the file server, which can make search more efficient and also enable to look for items within the entire corporate environment. Reason number three can be rightfully considered the core advantage of the solution. 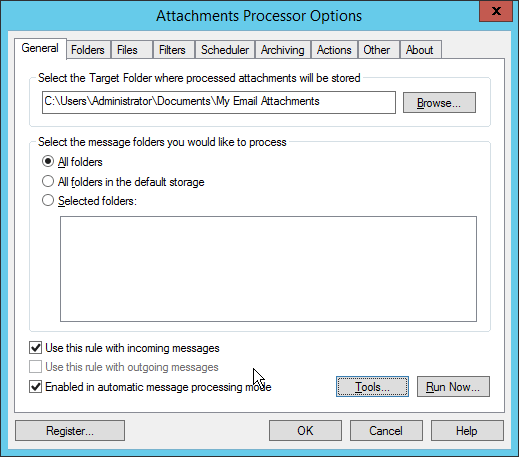 Even if you are unable to use a file server to store your attachments and all you can do is move them to a dedicated folder on your endpoint, there is still a way to decrease the size of your email database by getting rid of duplicate attachments. That is to say, without Attachments Processor, if you receive a message with an attachment, then reply to it, and then forward to someone else, one and the same file is saved to your database three times, not to mention instances when you deliberately send copies of the same file to a large number of users. The tool in question enables you to remove all the copies from the database and save just one copy to the specified folder. You may find the relevant setting under Other in the ‘If the file exists’ dropdown menu. The fourth reason deals with simplified attachment sharing for you and your colleagues. If a colleague of yours need a certain file that you have already used in your correspondence, instead of asking you to forward him this file, he can request access to it. However, giving your colleagues full access to your mailbox so that they could find the necessary attachment is not always the best choice, even if you think you have nothing to hide. But with all the files stored in a usual folder on a file server, there is no reason why you cannot grant access to any member of the company whenever you need, and send a link to the requested file. Thus Attachments Processor helps getting rid of duplicates on the corporate level, not just within a single mailbox. And last, but not least, here comes reason number five: flexible accessibility settings for files in the storage. The Archiving tab offers an impressive set of archiving options, including the creation of password-protected archives, so you can fine-tune Attachments Processor to keep your most valuable files secret, even though they are stored in a shared folder. However, if there are too many details in your attachment flow to take everything into account within a single rule, feel free to switch to Advanced Mode that enables to create and use several rules at a time. 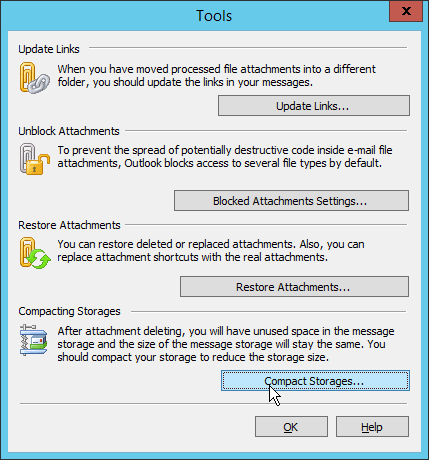 All in all, moving your Outlook attachments to a separate storage, such as a shared folder on your corporate file server, has at least five evident advantages. 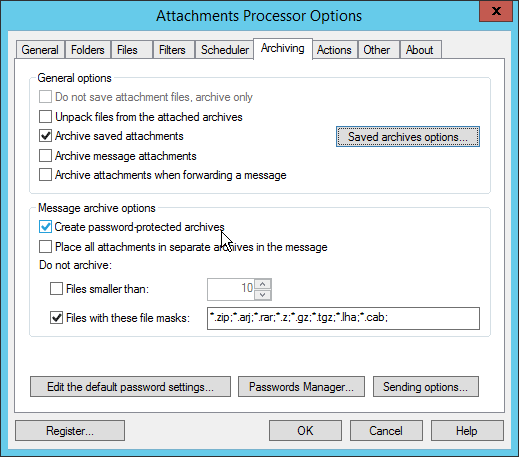 And Attachments Processor for Outlook by MAPILab is a most helpful assistant in this reorganization.